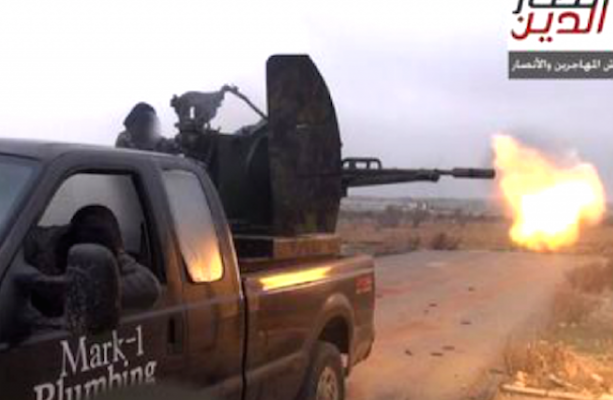 Texas plumber says he has no idea how his old company truck ended up in a jihadi photo from the front lines of the war in Syria produced by the militant group ISIS. Ansar al-Deen Front (aka “Supporters of the Religion” Front) is one of the newer Syrian militant coalitions, operating as an alliance of three “neutral” rebel fighters (mostly foreigners) only since July 2014. They are based in western Syria and claim not to be aligned with either ISIS or the various FSA and Nusra Front groups opposing ISIS. This isn’t terribly surprising since they are apparently mostly not Syrians — hailing from farther flung places such as Morocco and Chechnya — which probably reduces their stake in the internal divisions of the anti-Assad groups. The inquiry began after coalition troops raided a bomb-making factory in Fallujah last November and found a sport utility vehicle registered in Texas that was being prepared for a bombing mission. Investigators said they are comparing several other cases where vehicles evidently stolen in the United States wound up in Syria or other Middle East countries and ultimately into the hands of Iraqi insurgent groups — including Al Qaeda in Iraq, led by Jordanian-born Abu Musab Al Zarqawi. Of course, Al Qaeda in Iraq was subsequently renamed the Islamic State in Iraq and Syria (ISIS), bringing the whole thing full circle to today’s conflict. Tagged FSA, Iraq, ISIS, Middle East, Nusra Front, Syria, terrorism, Texas.